I came across this place while searching for a venue for my bday celebration. 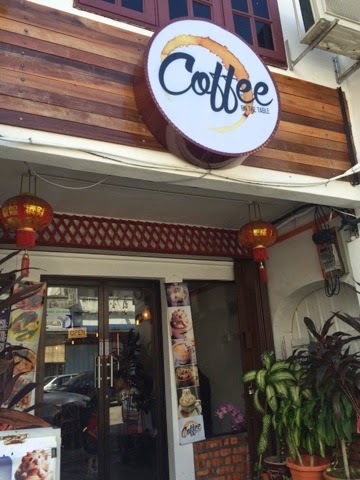 VKeong's post on Cafe Cafe made this place soooo tempting. Great interior, great ambiance. I headed there on a usual Saturday, I wanted to stay home the whole day but my generous friend called up and offered me a dinner that is so hard to say no to :) Upon arriving, there are ppl in charge that helps u park your car. It's just a usual shop lot with limited parking space, so we had to double park. Just tell them ur dining in cafe cafe, and they'll settle the parking issues for you. You might have to move your car half way through the dinner though. That's what we did. When I entered the place, I was so overwhelmed by the ambiance, felt cozy, romantic, a lil dark, but it was alright. The sad thing was, our table was so close to the next table... I mean, every table was so close to each other. Felt to awkward talking a lil louder. I can totally hear the next table's convo, haha, eavesdropping. Anyway, I went for the Menu 160, you can check out their menu here. First dish was Honey Truffled Prawns. The prawns were really fresh and the sauce was refreshing. A really light, simple, yet nice appetizer. Second dish was Escargot in Ratatouille. Third dish was the Raspberry Sorbet. Sorbets dont usually have something to shout about, but this sorbet was absolutely delicious. I miss the raspberry sorbet the moment I left the restaurant. Yummy!!! Fourth dish was the main course and I chose Bourgogne Cheek of Wagyu. Fancy name that I can't even pronounce, I just pointed at it and said beef. Don't like it when restaurants give fancy names to their dishes that most customers can't even pronounce. Anyway, back to the food.... Absolutely life changing. The sauce was immersed into the beef and totally complimented the beef original flavor. And the beef was really tender. Fifth and Last dish was dessert which is the Petite Four and Tiramisu.